Here’s another theory in the rough; something that I think is relevant to Fractal Art, and probably all artforms: There are “Artists” and there are “Craftsmen”. An artist is… I don’t know what an artist is, exactly. They make “Art”. What is art? It’s more of a concept, somewhat subjective in nature, but not just anything at all. When we look through an art book, something general, like a history of art, then we know what art is. You can feel it, or sense it, maybe not while viewing every item, but I think we all sense something when viewing art that we don’t sense when we’re looking at an image that is merely nice to look at or colorful. Nice to look at. That’s the other kind of work. People who make works that are only “nice-looking” are what I would call craftsmen. This isn’t supposed to be an insult; it’s just describing what takes place, describing the audience’s experience, or at least mine. Good craftsmanship takes talent, experience and dedication –technical ability. Think of “well-crafted furniture” as opposed to sculpture. They both have qualities of beauty but one of the items is the work of a craftsman and the other is the work of an artist. It takes a great craftsman to produce a good copy of an artist’s work. But it takes an artist to design the original. There are probably artists with great ideas that never bring them to fruition because they lack the skills of the craftsman necessary to do that. Artists work with ideas; craftsmen work with media (paint, clay, computer code, tools). Artists can also be craftsmen and vice versa. In fact, you could say that someone acts as an artist when they’re creating art and as a craftsman when they’re “crafting” something (manifesting the idea). When something looks really ugly but captures our attention and causes us to feel something and think “deeply” about it, that, I think, is art and nothing more than art. When something looks really “cool” and causes us to feel good or happy, like sunshine, trees and a handful of balloons kind of happy, that’s craftmanship. Eyecandy is probably a better word; sweet, but only satisfying in a shallow, temporary way. So you’ve got eyecandy at one extreme and at the other, stuff that may lack any sort of visual “attraction” yet is captivating and engaging to the mind in a deep, exhilarating way. Of course, art can be as colorful and sweet as a sugary piece of eyecandy. The essence of art being, I suppose, that it’s beautiful without “looking” good. Or rather, it’s beauty is of an inner kind, which stimulates the mind and it’s appearance is irrelevant. You could say, I suppose, that there are two kinds of visual beauty: eyecandy, and art; surface and substance. Which is better? or more important? Well, they’re different, aren’t they? Like the proverbial apples and oranges, or like candy and “food”. We want them both, I think. Although I suspect we’d put greater importance on art, the nutritious stuff, because it’s serious and deep, but what I think most people prefer is a combination, some balanced amount of both. Alright. How “balanced” is Fractal Art? Is it all just craftsmen?. Can an internet search bring up nothing except gallery upon gallery filled with superbly crafted toys for our little eyes and tiny minds to play with, to get bored with, grabbing up another, every few seconds, then going on to the the next brightly coloured Disney-thing in the toybox/website until we’re told it’s time to brush our teeth and go to bed? The real challenge I see for Fractal Art is, how do you make the deep, thought-provoking, serious kind of art with something like fractals that are generally abstract and lack most of the rich meaning and symbolism that realistic imagery can contain. In other words, how does one move beyond the mere “cool graphics” and “awesome” eyecanding to anything else at all? My strategy is to focus on the creativity of the algorithms and give the machine a free rein. (Let the computer become your brilliant assistant and steal everything it makes.) This means lots of experimentation, high volume, and picking out the stuff that looks good (if there is any). Of course, I like that sort of thing. It’s fun to play with parameters and anything random. The other strategy I can see is much more traditional and doesn’t appeal to me at all. 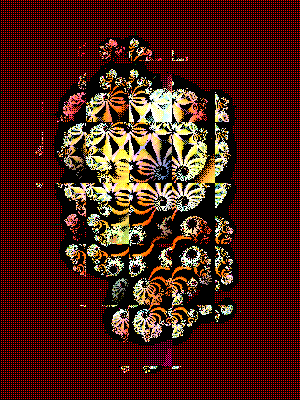 You use the fractal machine to produce images that you then assemble (layer) and tweak (mask, I think) and do other stuff, until the artist has actually created a piece of artwork pretty well by hand. There’s nothing wrong with this, it’s the normal way to make art, or was, I suppose, but surprisingly it tends to turn people into craftsmen rather than artists which is quite the opposite of what you’d expect, isn’t it? You would think that human intervention –human expression– would be the essence of art, and the raw output of a machine, lacking any sort of intelligence or intent, ought to be limp and lifeless and artless (no pun intended). It doesn’t have to be, but it’s been my experience that where you find the unexpected, you are more likely to find art. A very creative mind can produce an unexpected piece of fractal art through layering and masking, but it’s hard, and I might add, getting harder everyday. It requires craftsmanship of the highest order. 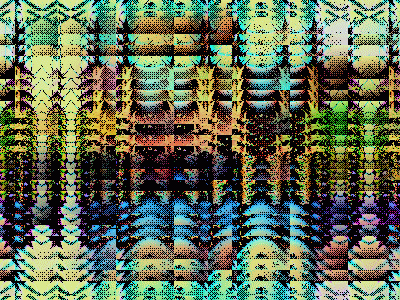 While the beflix guy tars all fractals with the same brush, the things he likes about ‘glitch’ art (randomness, instant gratification, not too ‘pretty’) seem like the same things you’re trying to get in your use of fractal software. That guy’s funny. He’s almost a work of art himself. I visited his site a few times before. He once drilled a hole in a calculator with a display that was encased in a vacuum tube, or something. The results were quite unexpected. His assessment of fractals is pretty extreme (unreasonable) but I can relate to his interest in the “graphical frontier”.